This executive management programme is tailor-made for UN managers. It provides practical tools and knowledge to help them address UN complex realities and deliver results effectively, both in challenging field locations and at headquarters. For more information, you may watch the recordings of our previous two online open house and browse a sample of online module here, by clicking on 'Log in as a guest'. Create high-performing teams, by motivating and coaching staff, and supporting their career development. Monitor and evaluate staff performance and address under-performance in a constructive manner. Translate overall visions into realistic goals, by planning strategically, implementing result-based management systems, mitigating risks, and managing resources and funds successfully. Communicate effectively with staff, senior managers and peers. Build and maintain long-term partnership with key stakeholders. Create an UN inter-agency peer network. This programme follows learner-centered design principles, and applies adult learning, case-based learning and social learning theories. 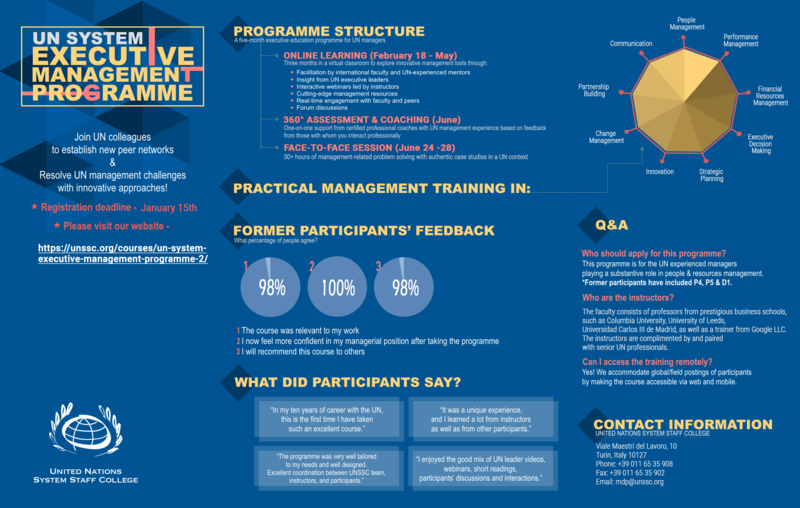 The programme consists of 3 phases: online, 360 and coaching, and residential workshop. During the online phase, you can access the learning materials from your computers and/or mobile devices. You can participate in online discussions with peers and online mentors any time you like. The 360 assessment will help you gain insights of your own management styles, and the coaching session will help you translate learning into actions. The residential workshop focuses on the application of learning. You will work on authentic cases coming from your group, collectively address challenges and seek solutions. Professors and experts will facilitate the problem-solving processes. One-on-one session with an experienced executive coach based on 360 degree assessment report. All the coaches have UN senior management backgrounds. We welcome UN officials with management and leadership functions at headquarters and in the field. Participants are expected to serve at P5+ or equivalent levels. Exceptions can be made for participants serving at P4 or equivalent levels in case of comparable management responsibilities. Managers from NGOs associated with the UN and government officials from member states are also welcome. Tuition and materials for eight online learning modules, 360° assessment and one executive coaching session. Tuition and materials for the five-day intense residential workshop at the UN Campus in Turin (Italy). The fee does not include travel, board and lodging, and other incidental expenses of participants while participating at the residential component of the programme at the UN Campus. The UN System Staff College will award Certificates of Accomplishment to all participants who meet completion requirements.